The British Touring Car Championship visit to Hampshire last weekend included the British F4 Thruxton Rounds 2018 as part of the support series for the BTCC, and this time the popular single seaters were racing in warm sunshine. The conditions were great for the visitors, but probably less good for the tyres. Qualifying saw Dennis Hauger take pole from Ayrton Simmons, with Hauger’s Arden team mate Jack Doohan in third place. The second fastest times, also used for grids, saw Hauger and Doohan in the top two places, with Paavo Tonteri in third. Saturday’s first race saw Hauger fight with Kiern Jewiss for the win, and after changing places through the race, it was Jewiss who took the lead on the final lap and the win, while Hauger ended up in the tyre barrier. Simmons came back from his ten place grid penalty for a second place, with Tonteri third. Sunday saw the sunshine continue, and the race also had some similarities to the previous day. This time, it was Hauger’s team mate Doohan who was fighting for the lead with Jewiss, and again, Jewiss took the lead on the last lap, although this time it was down to a mechanical issue for Doohan with no contact between the drivers. Tonteri took second, with Simmons finishing third, after managing to keep going from an incident that took Patrik Pasma out of the race. The two wins for Jewiss in the first two races of the weekend meant that if he could follow this up with a third win, he would take the Ford Triple Crown award for winning all three races at an event. The third race saw Doohan’s Arden at the front, and this time, the team did not have any last lap dramas at the front, and Doohan took the win, and became the first rookie to claim a win this season. Simmons came out top after a race long battle for second place, and Doohan’s team mate Hauger finished third. The consistent podium finishes put Simmons at the top of the table, with Jewiss second and Doohan third. Seb Priaulx is in fourth, with a tenth, seventh and sixth at Thruxton after a good start to the season. Next up for the drivers is a trip north to Oulton Park. 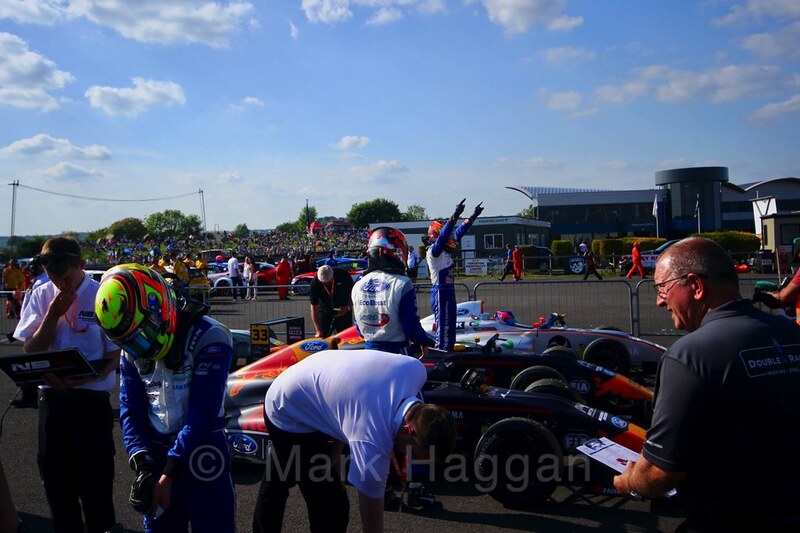 In the meantime, here are some photos from British F4 Thruxton Rounds 2018. British Formula Four, Motor Racing F4, FIA F4, Formula 4, Formula Four, Hampshire, Motor Racing, Motor Sport, Thruxton. permalink.